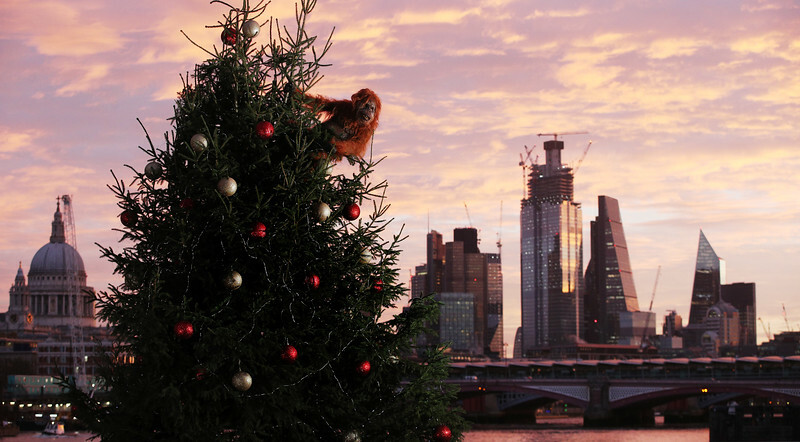 Londoners were stunned this morning as they witnessed what appeared to be an angry Orangutan on the loose and clinging to a Christmas tree at Coin Street, London. Further sightings were reported at locations across the capital including Oxford Street and the parks of London where the ape appeared to be in search of a new home. The displaced ape was actually part of the supermarket chain Iceland’s Christmas campaign, with the stunt being staged using sophisticated animatronics to highlight the retailer offering the choice of Christmas without palm oil. The disruptive campaign follows the banning of Iceland’s Christmas advert last week, which featured a baby Orangutan seeking a new home after its normal forest habitat has been eradicated as a result of deforestation. Iceland’s Orangutan will be touring Iceland regional stores throughout November.